The EZAutoFill is designed to slip right into existing fill line and offers a simple,low cost solution to maintaining water levels. It is probably a good idea to use very low water pressure with these devices in case of a malfunction and to extend life of valve. 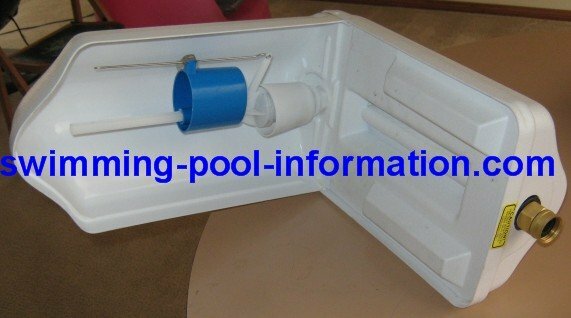 Shown below is protective cover for device-good to keep automatic pool cleaners and pets away. Click on either picture to go to their site. 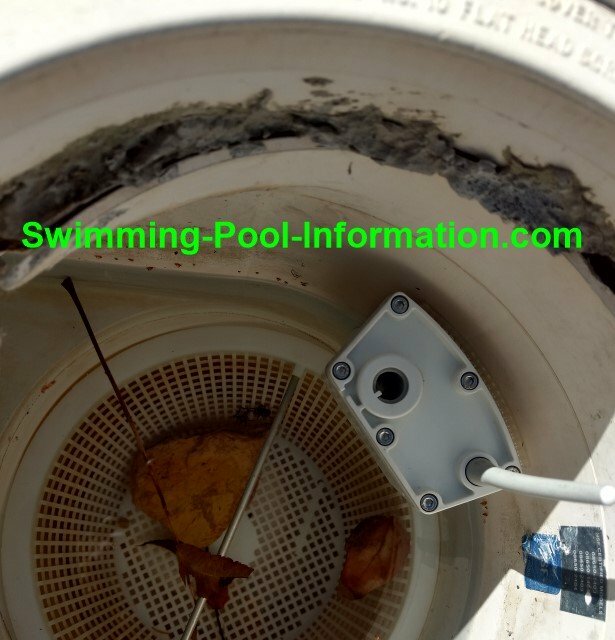 Shown above is the battery powered transmitter for the Poolmiser Smartmiser....the water level is between the top and bottom indentations. 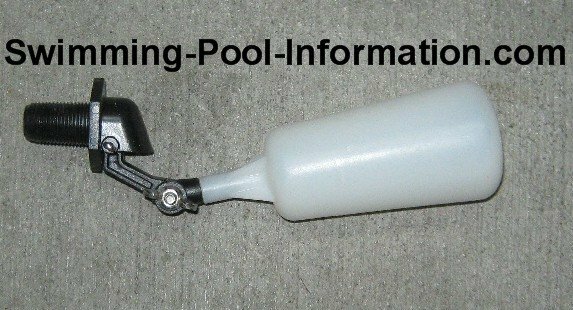 Shown below,it is velcroed to side of skimmer. 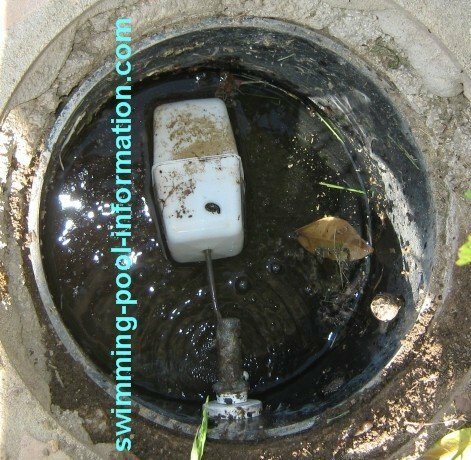 They say in manual it will transmit up to 50 feet,but I believe that is best case scenario with reciever unit high enough to get direct line of sight thru plastic skimmer lid. When reciever is mounted lower to ground at about same hight as water valve,the concrete may block signal so 10-15 feet may be more realistic. 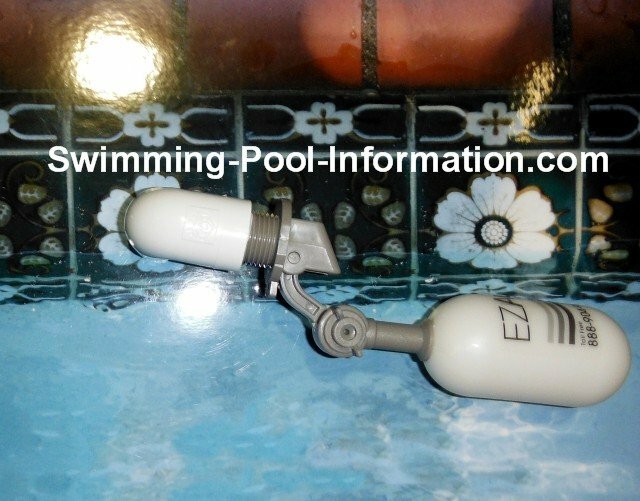 Valve and receiver shown below - this is NOT the Poolmiser receiver but gives you an idea of setup...receiver plugs into AC outlet. 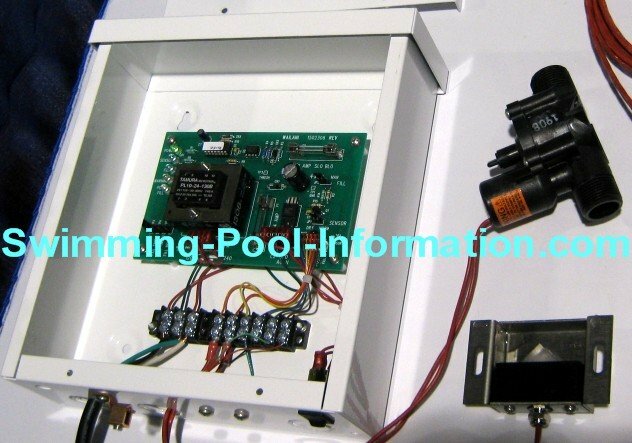 The automatic water level device below is called the Pool Sentry and fits on a standard threaded garden hose and fits over the deck of pool. 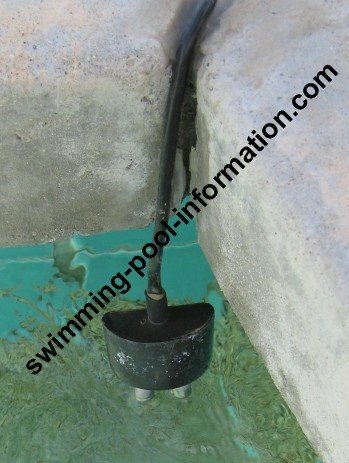 On second photo,you can see adjustable float device to adjust the height of water level...its cheap and it works,if you do not mind a hose laying on your deck. 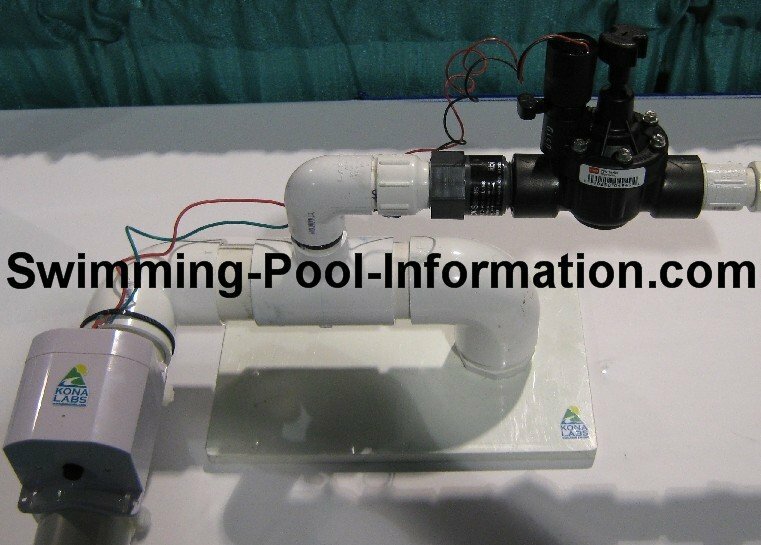 If you have a dedicated fill line,this auto water fill device is battery operated and can be configured to work on a timed basis or run by a sensor attached to tile line. Its made by Dayni in Los Angeles but needs a special battery and three regular double A's. (included)...Also,there is a very small probability that if you do not change batteries on a regular basis the batteries could fail while valve is in open position,however this is rare since it takes more power to open valve than close but it COULD happen so you must keep batteries updated regularly especially if you leave home for an extended period. UPDATE: heard this company is going out of business so if you buy product,make sure to get extra battery packs or have a source for the one double A that is 20 volts in pack! 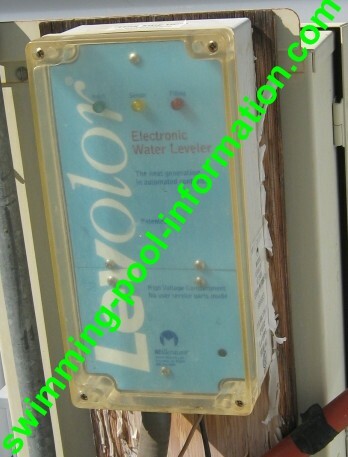 The spa and pool water level controller below is called the Levelor - shown below is the electronic brains of the system - it is connected to a solenoid which opens a valve like on a sprinkler system which fills pool. 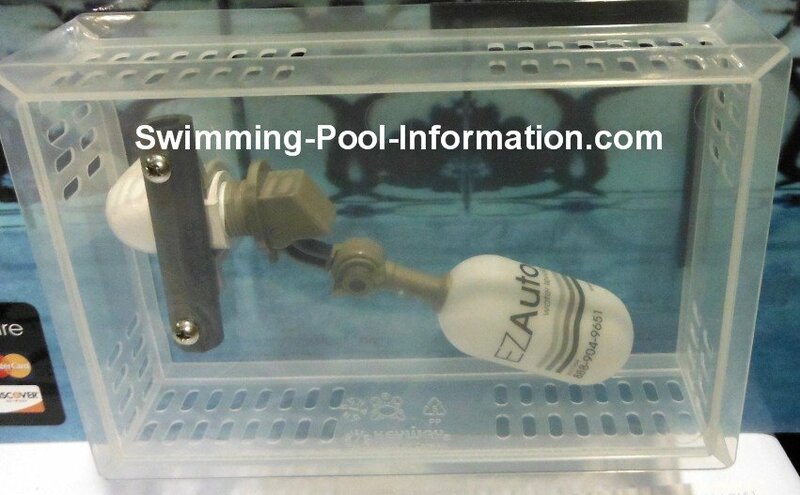 It is controlled from a sensor which has two metal rods which sense a disruption of current if water level drops below the rods signaling solenoid to open. 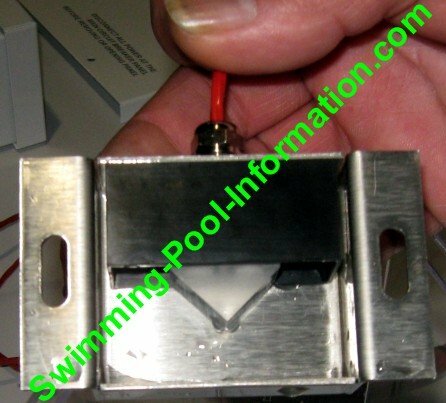 The Paralevel shown below is similar to the unit above but uses a clear acrylic sensor and a laser beam to complete circuit - when water raises and covers sensor,it blocks or defracts the laser light interrupting circuit and power to water valve. 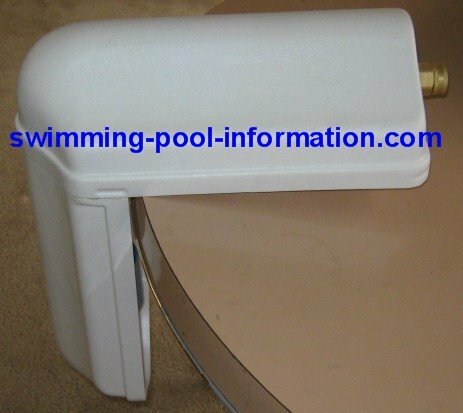 Shown below is a simple automatic swimming pool water filler - it is similar to old style toilet bowl floats. 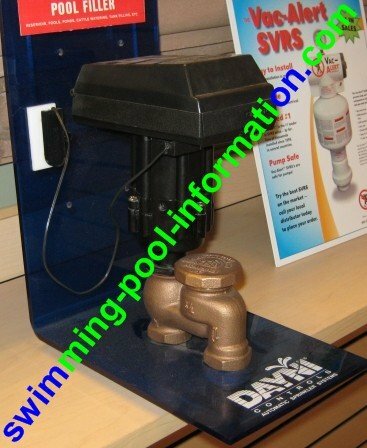 It is usually installed at time pool is being built because it needs its own well next to pool but can be installed after pool is built. Replacement Float. The plastic is not as strong as brass,but less calcium deposits perhaps? Same basic principle as unit above,but more stable and robust control float.